Seriously, guys. in Spanish EEUU means the USA. It's weird, i kno. (Why not just the EU for "Estados Unidos"?) But what's weirder is the fact that the contents of this package seem to have been made in different places, depending on what language you speak. 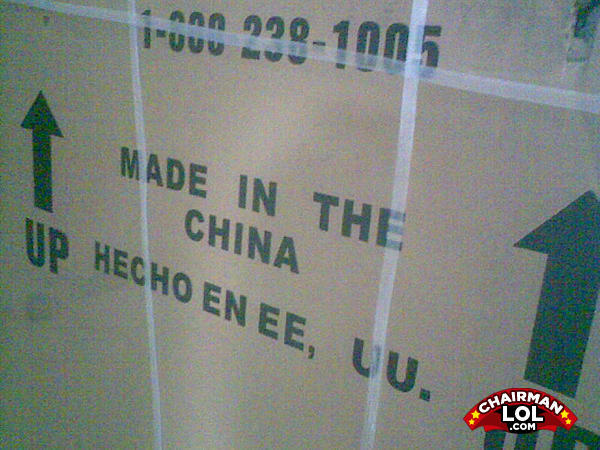 CHINA, Y U NO MAKE THE CHINA? This is what happens when boxes are adopted. It's locationally challenged. The abbreviation EEUU has 'double' letters because it refers to words in the plural: EstadoS UnidoS, even though the abbreviation EUA (Estados Unidos de América) also exists. What did the homosexual say to the purse walking down the street?